Anyone who runs for fitness or does a sport that involves running (triathlon, football etc). We see everyone from Olympians to the absolute beginner who may be starting to include a few minutes jogging into their weekend walks. Isn’t it all about my feet? No! (And we are not trying to sell you new trainers). The alignment, strength and position of the feet are all important factors, but it is important to improve other areas like the pelvis, the upper body and your technique. Problems further up will have a direct bearing on how you work your legs and feet. The goal may be to make you faster, more efficient or more economical with your running. For many clients, the goal is to avoid injury. Runners are prone to repetitive strain injuries. This means that even a small amount of abnormal stress on the body, repeated many times, can cause a breakdown of their tissues, pain and inflammation. The gait analysis will aim to identify alignment problems and technical problems that are causing injury, likely to cause injury, or slowing you down. 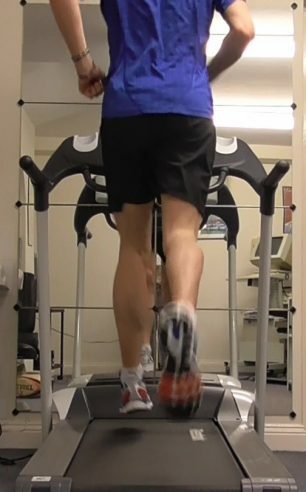 An inefficient running gait results in much of the energy being lost during the ‘stance phase’. This can often be observed when we video a client running but the good news is that it can be improved! Will it stop me getting pain? No! The results of the analysis usually mean we give you some ‘homework’ to do. It is the work done by you that will stop you getting pains. This changes a little from client to client because our individual biomechanics can vary greatly. We first find out what running problems and goals you have. For example, it may be that you have a recurring injury. Next, we perform a series of tests which are chosen based upon your individual problems and goals. Then we get you walking and running on the treadmill and video you. The slow motion and freeze frames of the video can show up a lot of problems, some obvious and some subtle. In addition to this, with the improvement in video capability including slow motion, on our phones, if you can bring along any footage of you running, particularly tired but relatively quickly, this will help enormously. Seeing your movements in a natural environment is always more revealing. We finish by prescribing your homework of exercises and/or running drills. Sometimes treatment is required and we can either do this for you or make recommendations for your usual Physiotherapist (a lot of our clients are not local). Please come with running shorts (either traditional or lycra) and a top that is a different colour to the shorts. Bring your current training shoes and some old ones so we can check the pattern of wear on the soles. Will I need a second appointment? If you have achieved the set goals we don’t need to see you again. Many clients benefit from a review appointment about 6-8 weeks later. We can then check progress and advanced exercises or technique changes to make further progress.